Field of corn, closely planted as a biomass crop. Zea mays is an erect, robust, usually unbranched annual plant; it can grow up to 6 metres tall but is more likely to around 2 metres with cultivars that can range from around 1 metre up to 3 metres or more. Original habitat is obscure, probably S. America or Mexico. ]. It is not so sweet and also takes longer to mature so is a problematic crop in Britain. There are many other uses for this plant as detailed below. Dent corn has mostly white to yellow grains. 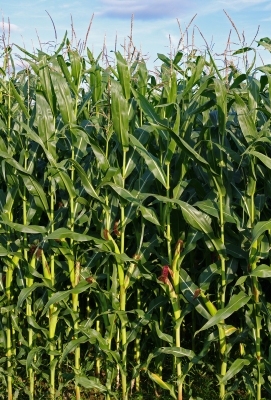 This and Flint corn are widely grown for oils, cornflour, cereals and silage crops.